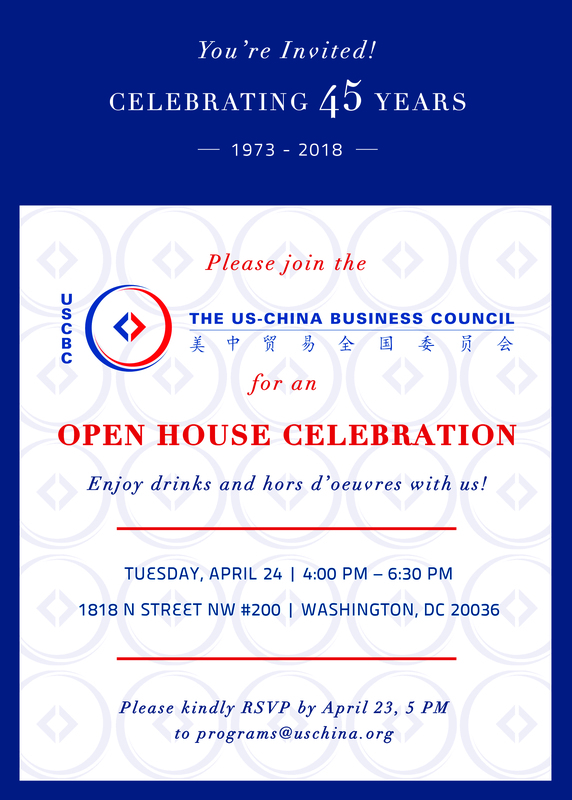 Please come enjoy drinks and hors d’oeuvres with the US-China Business Council to commemorate 45 years of serving our members! RSVP by April 23, 5 PM to [email protected] or online here. The US-China Business Council hosted an open house on Tuesday, April 24, at their DC office in honor of their 45th Anniversary. Founded on April 24, 1973, USCBC was originally created by a group of American companies to act as a bridge to better navigate a cautiously opening Chinese economy. To see the full announcement by USCBC President John Frisbie, please click here. Many thanks to all of our members who came to celebrate! Pictures from the event can be found here.